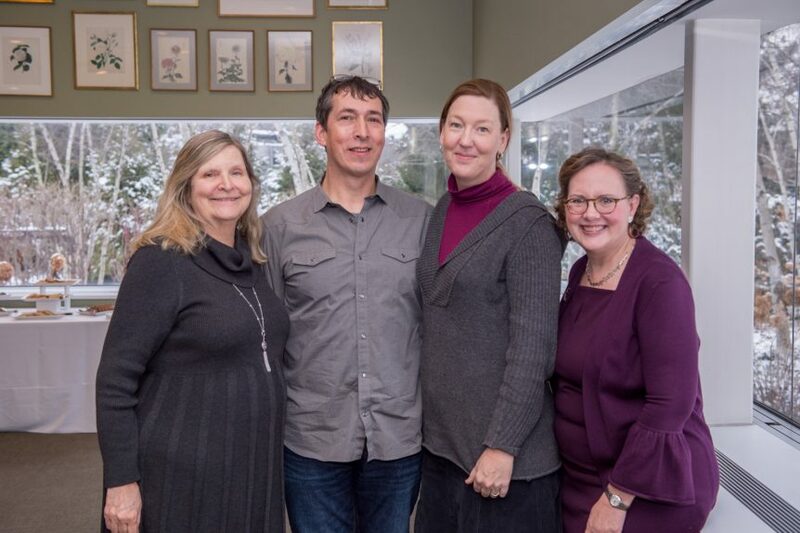 On Wednesday, January 24, The Auxiliary of NorthShore University HealthSystem (NorthShore) proudly kicked off planning for the 2018 American Craft Exposition (ACE) at the Chicago Botanic Garden. More than 30 ACE committee members, including this year’s Co-Chairs (pictured above), Leslie Sevcik (of Evanston) and Kathy Leighton (of Northbrook) gathered to discuss plans for the 34th annual event, which will once again be held on the Garden’s exquisite grounds. In addition to both co-chairs, there were several speakers during the kick-off event including Deborah Tabor, NorthShore’s Administrative Director of Psychiatry and Jodi Zombolo, Associate Vice President of Visitor Events and Programs at the Chicago Botanic Garden. Long-time ACE artists Nathan and Jennifer Falter (pictured above) traveled from their home in Springfield, MO to treat attendees to an inside look of their clay studio, their craft, and some new pieces for future shows. Before the event came to a close, last year’s Co-Chairs, Laura Koh and Melissa David, presented two checks in the amount of $212,500 each to the beneficiaries of ACE 2017. One was given to Karen Kaul, MD, PhD, Chairman of the Department of Pathology & Laboratory Medicine to support Pharmacogenomics Research, and the second was given to Trevor Bullock, DO, CAQSM to support Orthopaedic Regenerative Medicine Research under the direction of Dr. Jason Koh. Funds raised during ACE 2018 will support increased access to psychiatric services at NorthShore through the creation of a Psychiatric Urgent Care Program and the implementation of a collaborative care model for providing mental health services to families. These programs aim to assist clinicians and families, while also vastly reducing wait times for patients who are in need of urgent psychiatric care.